Maryal Barnett believes the future of dressage and the welfare of our horses is dependent on the quality of education that our professionals obtain. This belief, combined with the desire to give back to the sport that has given her such a rewarding and happy life, led her and her late husband Charles to establish The Continuing Education for Dressage Instructors Grants, which are available through The Dressage Foundation. Today Maryal still helps to make it possible for other present and future dressage instructors/trainers to be able to obtain quality education through this program. In the infancy of dressage in the United States, Lowell Boomer, along with many others, saw the importance of education. 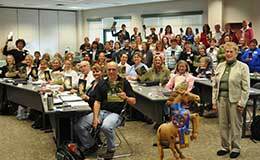 They founded the United States Dressage Federation (USDF) to unite and educate Dressage enthusiasts. 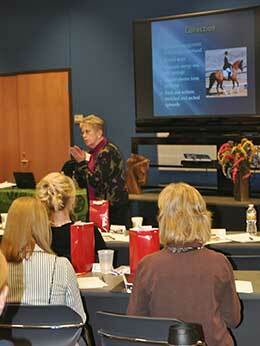 Violet Hopkins gave her farm, time and wisdom each summer to make the Vi Hopkins Seminar for Dressage Instructors possible for those hungering for more knowledge. In 2007 the Barnett Family donated a carved horse head called “Lest We Forget” to the USDF through The Dressage Foundation. Charles discovered the horse head, and he and Maryal were struck by the natural beauty of it. They saw the connection that both the horse head and the USDF began from raw material, and through talent and wisdom, became what they are today. “Lest We Forget” honors the 81 founding organizers who met in Lincoln, Nebraska in 1973 to form and organize the USDF, and permanently remembers Lowell Boomer, who devoted many years of hard work in transforming the founding group’s dream into action. Please see Maryal’s Teaching Schedule and Judging Schedule pages for those dates and locations. Her biographical information is on the About Maryal page.